Are you looking for a captivating and engaging speaker for your event? Veronica Pullen is an experienced public speaker on social media marketing, Facebook advertising, leveraging your knowledge into online programs, and running a business around your disability. Veronica helps coaches, trainers, consultants, mentors, speakers and service based business owners to attract and enroll an endless stream of their ideal clients online by standing out from the crowd and positioning themselves in their Category of One. 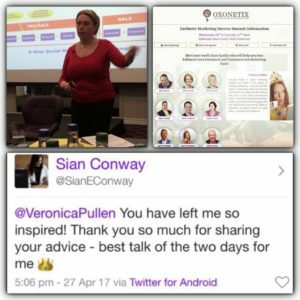 Unlike many other social media marketing ‘experts‘ that you’ll meet, Veronica walks her talk, with 100% of her own clients originating from relationships built and nurtured online. She met her husband on Facebook and they live tweeted their wedding in 2011. Over 200 followers attended their wedding remotely, including a few celebrities; Duncan Bannatyne, Eamonn Holmes, Martin (Money Saving Expert) Lewis, The Subways, and Al Murray. They even received a personal congratulations from Adrian Chiles and Christine Bleakley during their ITV breakfast show on their wedding day. 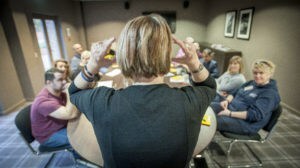 Born with 60% hearing loss, diagnosed with Rheumatoid Arthritis at the age of 12, it was the diagnosis of Retinitis Pigmentosa bringing an automatic revocation of her driving licence in 1996 that prompted her to move her social life online – starting the journey of building relationships on social media that has led her to building the expertise she shares with you today. Having been booked as a keynote speaker three times, including being asked to return to the same event and keynote again the following year, Veronica has spoken in front of audiences ranging from five people to 700, speaking for durations ranging from ten to ninety minutes. Voted in top three speakers overall by attendees at the 3-day Small Business Success Summit – one of only two woman speakers at the event. 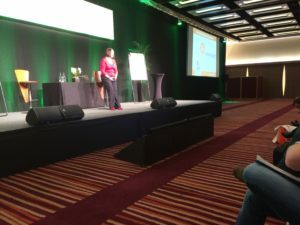 Speaker at Association of Professional Coaches, Trainers and Consultants Superconference – the only woman speaker at the event. 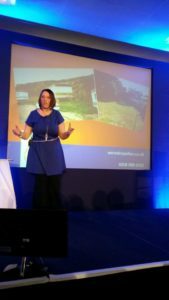 Keynote Speaker for Horley Chamber Business Expo – twice. Keynote speaker for The Smart Enterprise “Suitability” Annual Expo – twice. Spoken to audiences ranging from 5 to 600+ people. “We were lucky enough to have Veronica speak at Eagle Radio’s Biz Breakfast event in Woking, Surrey. She was brilliant! Warm, engaging, knowledgeable and most of all made perfect sense! 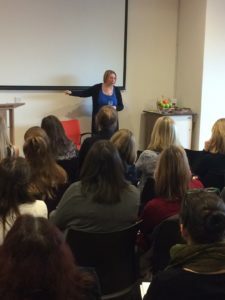 “For the majority of our club members, the realm of social media websites is foreign – so, we didn’t know quite what to expect from Veronica’s talk. What we got was an entertaining, illuminating and informative hour from a speaker who, obviously, knows her subject and is quick to react to her audience. Veronica realised immediately that most of us were retired and, therefore, adapted her presentation to concentrate more on the social side of such sites as Facebook, Twitter, Pinterest, and Linkedin rather than their business opportunities. Veronica has overcome several disabilities to build her own business and her personality is truly inspirational. Having curve ball after curve ball hurled at her, rather than sit at home feeling sorry for herself, she has used social media to her advantage. Creator of the Social Marketing Profits Blueprint™ – 8 steps to profitable social marketing. Author of two online marketing books, available at Amazon. Winner of Association of Professional Coaches, Trainers, and Consultants “Small Business Coach of the Year” award. Winner of Entrepreneurs Circle “Surrey Entrepreneur of the Month” award – twice. Winner of Entrepreneurs Circle “Make it Happen” award. Winner of Theo Paphitis’ “Small Business Sunday” award. Winner of Entrepreneurs Circle “UK Entrepreneur of the Month“ award. Shortlisted in Association of Professional Coaches, Trainers, and Consultants “Trainer of the Year” award. Finalist in Entrepreneurs Circle Entrepreneur of the Year awards in “Marketing Campaign of the Year” category. Surrey Mirror monthly social media columnist for two years. 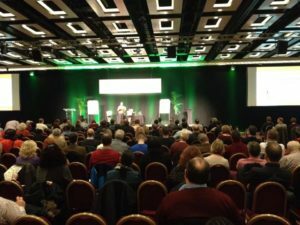 On stage at the Small Business Success Summit in London, speaking to 400 coaches, trainers and consultants. On stage at the Reebok Stadium in Bolton, speaking to 600+ small business owners at the Entrepreneurs Circle National Event. Interested in Booking Veronica Pullen to Speak at Your Event? Buy Facebook Ads? Not Yet! Authority Content: Consumer or Creator? You Are Not Good Enough! Are Paid Facebook Ads Essential to Generate Paying Clients? You can withdraw consent at any time by clicking on the unsubscribe link in any email you receive.